Racing Service Watanabe is probably one of the first names that comes to mindwhen it comes to Old School JDM Wheels.The most noteable is The Watanabe Type R with its 8 spoke Banana type design and deep dish. The Watanabe GR-8 was is now a historic wheel that inspired the XXR 002. 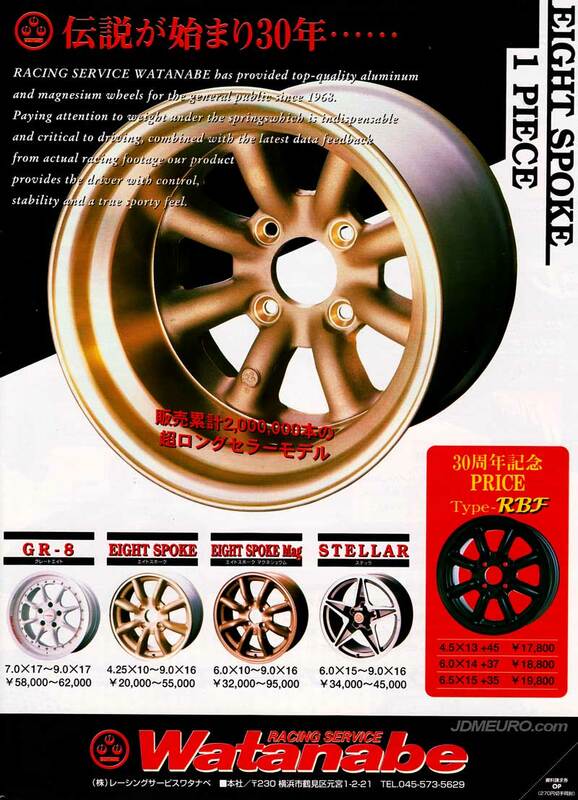 The Watanabe Stellar is a JDM Wheel that I actually have never seen before. For an added price, the 8 spoke models are not only available in aluminum, but also Magnesium Wheels. maybe you can help, i am looking for a rim for my Porsche. its a 964 changed to G-model, with a lot of 993 parts. its more for off road, and i want to fit 16 Inch rims but they need to fit 993 turbo callipers, the only rim that will fit is D90, i like your eight spoke mags needs 5 holes.